1. Raw Telemetry Stream: Science data is collected over data collection cycles of 10, 20, 40, or 80 spins of the S/C corresponding to 1024, 512, 256, 128 bps of the S/C telemetry channel. During the fastest telemetry rate, 1024 bps, 1 S/C telemetry minor frame accumulates per second. This also corresponds to 1 LAN minor frame per second, or 28 bytes LAN data per second. During the slowest telemetry rate, 128 bps, one eighth of a S/C telemetry minor frame is accumulated per second. Therefore, one eighth of a LAN minor frame is also collected per second. 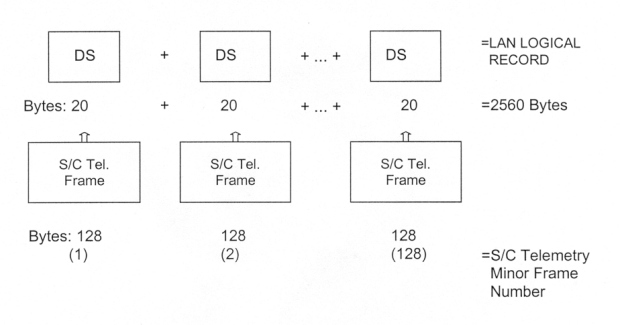 Note: The LAN Digital Science Bytes, bytes 96-115 of each S/C telemetry minor frame (20 bytes total), can, in principle, be assembled into the Science Data Block, or LAN Logical Record Block Format. However, these 128 20-byte Digital Science Blocks are never actually formed into a contiguous LAN Logical Record block during any step in HISCALE data processing. Rather, the LAN Logical Record only represents the format of 1 complete collection cycle of LAN Digital Science Data--i.e., it represents the format of the 2560 Digital Science bytes outputted during 4 consecutive S/C telemetry major frames. 2. Level 0 Processing: JPL receives the raw telemetry stream, which contains the science data in the S/C telemetry minor frame format. JPL then uses LAN EDRGEN software to generate the EDR files which Fundamental Technologies in turn uses to create level 1 data. 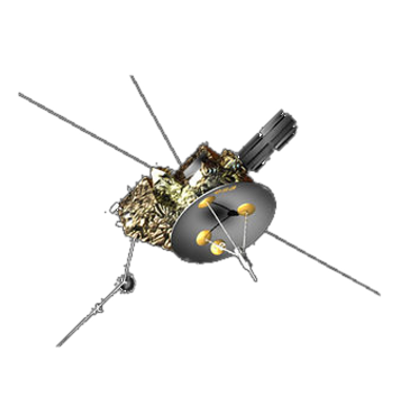 The basic function of LAN EDRGEN is to extract all pertinent LAN experiment and spacecraft information from each S/C telemetry minor frame and to then assimilate this information into a LAN EDR record. EDRGEN extracts 256 of these LAN minor frames for each EDR record - which is representative of 2 complete data collection cycles of LAN Digital Science Data plus the corresponding H/K, S/C ID, etc., information, and places these frames in sequential order, creating the LAN EDR Data Block. 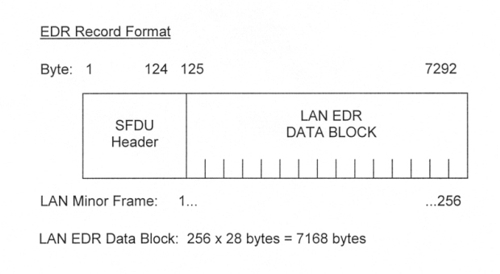 EDRGEN also places a 124 byte SFDU Header upon each of the LAN EDR Data Blocks bringing the total number of bytes per EDR file to 7292. 3. Level 1 Processing: Fundamental Technologies receives the 7292 byte EDR records in fixed length, binary files, each of which contains approximately seven days worth of data. These files are then used as input for the ARCGEN (Archive Generator) software. The initial routines of ARCGEN are primarily used for data integrity/validity checks and extraction of specific bytes contained within each EDR record. After this initial phase, the SFDU header is extracted from the LAN EDR Data Block. The LAN EDR Data Block is then itself partitioned into the two complete data collection cycles it contains (4 LAN major frames each). 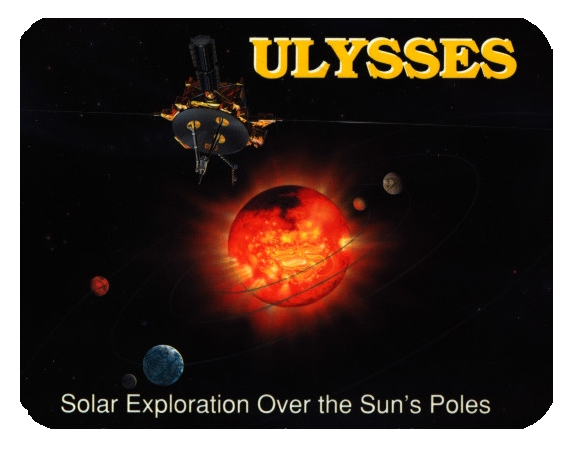 The data contained within these two data collection cycles is then used to create the finished Level 1 product, the ULAyyddd.pha, ULAyyddd.rat files (the SFDU header information is also contained within these files).